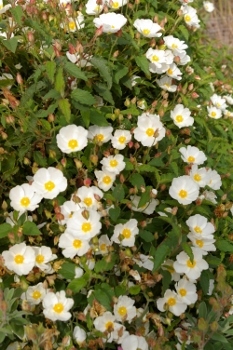 Joy Creek Photo Archive (c) all rights reserved (C. populifolius x C. salviifolius) Cistus x corbariensis is a dense, low shrub with dark green evergreen leaves that have wavy margins. Reddish buds open to white flowers with yellow centers. Late spring to summer. 3 ft. x 5 ft. This is a genus of small to medium sized evergreen and semi-evergreen shrubs that are mostly from Europe and North Africa. They thrive in full sun and light, well-drained soil. They are drought tolerant when established.